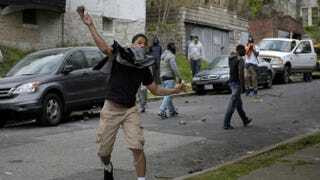 A youth throws a rock at police on April 27, 2015, in Baltimore. Violent street clashes erupted in Baltimore after friends and family gathered for the funeral of Freddie Gray, a 25-year-old black man whose death in custody triggered a fresh wave of protests over U.S. police tactics. Baltimore is not a think piece. Not every action in a riot is a metaphor. Freddie Gray’s back is really broken and he is actually dead. As the city variously rests and burns, lots of smart folks have glossed over these facts. Most of us have the luxury of not living in the city today, wondering if our homes, stores or community centers will make it through another rough night. Many of us also have the fortune of not having lived in the city’s toughest neighborhoods these last few years and years before that, wondering if our sons, fathers or selves will make it out alive after another encounter with the police. We have to hold two important truths in tension. First: There are deep roots to Freddie Gray’s death, and to these riots, that cannot be papered over. This is the city of dozens of slave markets, a place that grew and thrived on separate-but-equal, a city that carefully tucked and stacked black folks into the poorest of houses, schools and neighborhoods, year after year, until this day. When it comes to Freddie Gray, that history matters. Perhaps more than anything. And it must be addressed, maybe before everything. We don’t yet have all the facts—never will—but there is a solid chance that racism killed Freddie Gray. Second: We must proactively address systemic racism, excise this poisonous root, while pulling our young people close to us and speaking truth to them as well. It’s foolish to uncritically accept every rock thrown in Baltimore’s streets, just as it is foolish to accept every police narrative. When black people live in fear in their own communities, their dignity and their black lives and their black spaces matter as well. It’s simple reality, not pandering or privilege, to acknowledge this fact. We can lend a listening ear to young people’s pain, speak back to them in truth and love and help guide them into less destructive decisions for themselves and their communities, as they guide us in many ways as well. The ongoing reaction to unrest in Baltimore has exposed a gap between our most thoughtful commentators and folks currently living in these communities. Conservatives, who use their pens to dismiss the legacy of white supremacy and instead focus on supposed black pathologies, and liberals, who use theirs to refuse to reject any form of black anger, are doing actual neighborhoods no practical good. Don’t listen to them. Don’t listen to me. Listen to the folks on the ground. Hear from the mothers of Baltimore, the activists, the clergy, the teachers, who continue to live there and have for years. The people who simultaneously want to hold accountable a police force that just doesn’t get it, and help young people avoid destruction. The real truth in Baltimore is hard, messy and in the middle. It’s found in a space between the delusion of colorblindness and the destruction of rioting. It involves addressing legacies of racism in practical ways through bias reduction, affordable housing, economic development and criminal-justice reform; while also supporting young people through mentoring, fatherhood and motherhood programs, mental-health services, job training, education and more. A man is dead and he should not be. A community is threatened and burning and it should not be. Let’s acknowledge that and do the hard, practical work of rooting out Baltimore’s racial evils and rebuilding its neighborhoods. In this way, perhaps we can give our grandmothers some modicum of peace and their grandchildren some semblance of hope. Joshua DuBois is the author of the best-selling book The President’s Devotional: The Daily Readings That Inspired President Obama and is one of the country’s leading voices on community partnerships, religion in the public square and issues affecting African-American men. DuBois led the White House Office of Faith-Based and Neighborhood Partnerships during President Barack Obama’s first term. He now leads a consulting firm, Values Partnerships, that creates faith-based partnerships for the public, private and nonprofit sectors. DuBois has been named to The Root 100 and Ebony magazine’s “Power 150” list of the most influential African Americans in the country and has written four cover stories for Newsweek magazine, including a piece titled “The Fight for Black Men,” which historian Taylor Branch called “stunning.” Follow him on Twitter.